CD review: "Brain in a Box"
Rhino Records' ambitious "Brain in a Box"is imaginatively designed, wonderfully crafted, and lovingly produced. And yet, it's not really very listenable. Despite this, it may still be worth the rather steep price. If you're a sci fi buff, then "Brain in a Box" is a bargain. Where else are you going to find one full disc each full of the theme songs to so many sci fi movies and TV series? Or a full CD devoted to lounge music with science fiction themes? Pop music along the same lines? Or the truly bizarre stuff on the redundantly labeled "novelty" disc? But like last year's "Hot Rods & Custom Classics"  a four-disc collection devoted to songs about cars  most listeners may find that the packaging is better than the music. And the packaging is among the best ever for a box set. 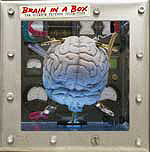 Set in a cube made to look like a riveted metal box with glass windows, this really looks like a brain in a box: A large, disgusting looking human brain floating in liquid connected to electrodes. The 200-page booklet is set up like an old-style science fiction magazine from the '50s, and is full of all kinds of neat history about science fiction  illustrated with wondrously campy photos and illustrations from the past. Contributing their thoughts to the booklet are sci fi author Ray Bradbury and radio d.j. Dr. Demento. Just having this sit on your bookshelf is a guaranteed conversation-starter. (Although the conversation may go something like, "Oh, gross ... what is that?") The box has a cool factor up there with an Elvis painting on velvet. As to how many times you'll actually want to listen to the theme from "Lost in Space" or Jimmy Durante's "We're Going UFOing" ... well, you're going to have to find something to do after May when "Star Trek: Voyager" goes off the air.